Unmanned aerial vehicles (UAVs) often operate in demanding environments that require precise and reliable sensory feedback. Yet, UAVs are also especially sensitive to incremental changes in weight and volume. As a result, autonomous platform operators may forego valuable sensing capabilities or compromise overall platform performance. LORD MicroStrain® provides high-performance inertial sensing systems with minimal weight, and size barriers. MEMS technologies combined with GPS and sophisticated estimation filtering offer accurate and reliable data quantities to provide precise control, stabilization, and pointing at the best value. As a result, LORD’s inertial solutions enable cost effective integration of primary and secondary unmanned navigation or ISR (intelligence, surveillance, and reconnaissance). LORD MicroStrain provides tactical and high-end industrial grade miniature inertial sensors to the UAV market. Our user implementation procedure is streamlined to support rapid evaluation and integration with little development overhead, and low barriers to incorporate the latest sensor models and capabilities. LORD GPS-Aided Inertial Navigation Systems (GPS/INS), Attitude Heading Reference Systems (AHRS), and Inertial Measurement Units (IMU) are backed by comprehensive development kits. 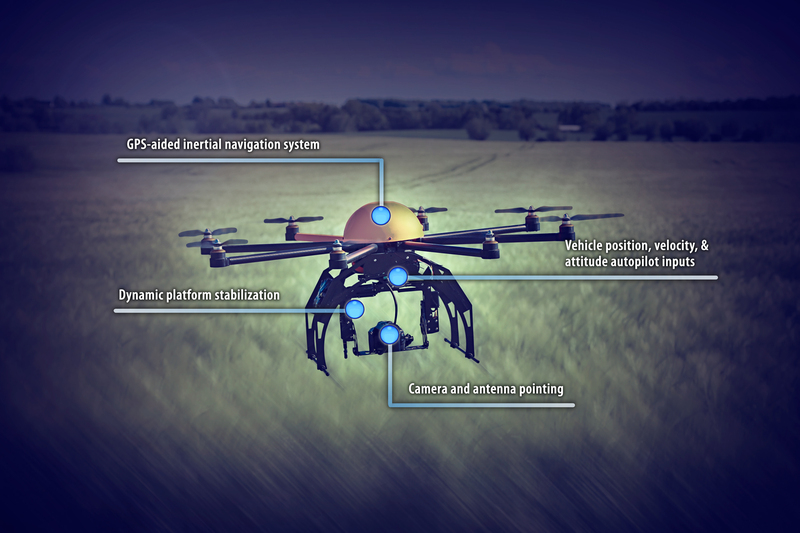 Combined with the forward compatible MIP™ communication protocol, unmanned air vehicle operators have the flexibility of moving up or down the product line with little or no rewriting of code. Calibrating each sensor to the same strict standard ensures identical performance between same model devices. As a result, UAV developers can be confident that integrating LORD MicroStrain sensors into their systems is a repeatable, cost-effective process.